With the dance floor in mind. Since its inception in 2004 Shogun Audio has gone on to become one of the most essential labels in dance music today. Driven by it's founders Friction and business partner K-Tee the Shogun brand has developed in such a way that it is now an all-encompassing drum and bass juggernaut releasing anything from the deep and minimal sounds of Icicle to the dirty tech grooves of Break and the soulful vibes of Alix Perez. Brighton raised, multi award winning DJ Friction is a member of an exclusive club. He is one of a handful of DJ's to have smashed through the ranks and become a superstar in his genre simply through an unbelievable talent behind the decks. This year has seen him add more accolades to his ever increasing CV and is regarded by many as not only the most skilled but the most diverse DJ in drum & bass. Jeroen Snik - aka Icicle - is recognised as one of the most technically advanced and highly-respected producers in electronic music. Mastering Tech-Funk better than any other, Icicle's music is graceful yet daring and, without doubt, technically remarkable, tinged with intricate drum patterns reminiscent of Photek and entrancing, enveloping bass-lines à la Jonny L and Optical. 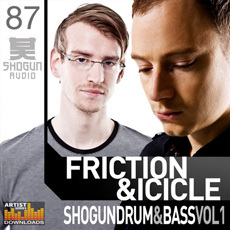 For their Sample pack Friction and Icicle have come together to produce a vast collection of sounds and samples which are engineered solely with the dance floor in mind, and introduce a palette of inspirational beats, basses and musical loops which will no doubt feature in countless tunes in the coming weeks and months. Shoguns Drum and Bass vol 1 includes 780 Drum and Bass Samples, recorded in 24Bit and split to offer 104 Loops and 676 One Shot Samples. Breaking it down, this pack includes no less than 27 Hard and Heavy Bass Loops, 40 Fresh Drum Loops, 8 Bonus Classic Breaks, 29 Inspirational Synth Loops, 8 Multi Sampled DnB Basses, 30 One Shot Bass Tones, 58 Special FX, 63 Must Have Stabs, 12 Synth Multi patches, 8 One Shot Synths, plus over 250 Single Drum Samples to program your own beats. If you produce Drum and Bass, Dubstep, Breaks or Electronica and are looking for a fearsome and intelligent selection of Cone Snarling Subs, Tech Synths, Progressive Basses, Crisp One Shot Drums and Huge FX - this is a collection that won't disappoint.